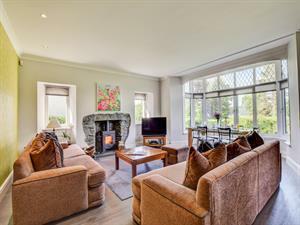 The Lake House015394 37417work Self-cateringThe Lake House is a fantastic ground floor apartment situated in the exclusive Storrs Park area near Bowness on Windermere. Sleeping 5 in two bedrooms, it has a large modern open plan kitchen/lounge area with wood burning stove. The extensive private gardens lead directly to the shore of Lake Windermere with a pebble beach and private jetty. NB: There is direct access to the Lake and Jetty from the garden, children must be supervised at all times. The Lake House offers weekly bookings starting on Saturday. The Lake House is a fantastic ground floor apartment situated in the exclusive Storrs Park area near Bowness on Windermere. Sleeping 5 in two bedrooms, it has a large modern open plan kitchen/lounge area with wood burning stove. The extensive private gardens lead directly to the shore of Lake Windermere with a pebble beach and private jetty.